Enterprising merchants came up with a practical alternative: cent-sized bronze tokens which found wide acceptance in commerce. 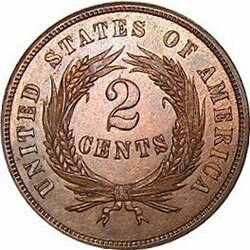 Noting that bronze was considerably cheaper than the copper-nickel alloy then being used to mint cents, Treasury officials hit upon the notion of switching to lighter-weight bronze cents and also decided to make bronze two-cent pieces to help re-establish coins in circulation. There had never been a two-cent piece in the nation’s prior history, but the concept was not entirely new. Twice before, in 1806 and 1836, Congress had considered proposals for two-cent pieces made of billon – silver debased with a high percentage of copper. Both times, however, the plans had been rejected on the grounds that such coins would be easy to counterfeit. That was not an issue in 1863, and the urgent need for coinage made a persuasive case for issuing such a coin on that occasion. 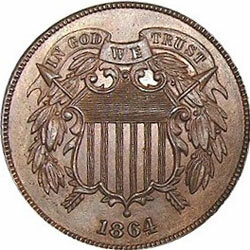 The mating of the two-cent piece with the motto “In God We Trust,” starting in 1864, seems to have been a marriage of convenience. Secretary Chase had been pondering the placement of some such wording on one or more of the nation’s coins ever since receiving the Rev. Watkinson’s letter early in the war, and production of patterns bearing possible mottos underscored the importance he placed on this objective. The two-cent piece made a perfect vehicle, for use of the motto there would cause no undue disruption or confusion. Initially, the Mint’s chief engraver, James Barton Longacre, fashioned two pattern two-cent pieces carrying not only dissimilar designs but also different inscriptions.